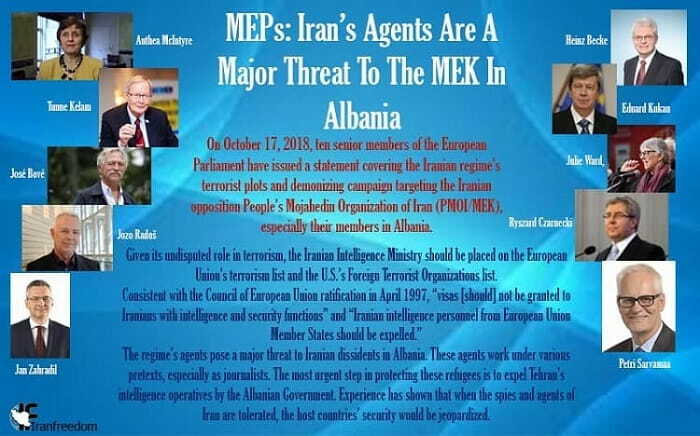 On October 17, 2018, ten senior members of the European Parliament have issued a statement covering the Iranian regime’s terrorist plots and demonizing campaign targeting the Iranian opposition People’s Mojahedin Organization of Iran (PMOI/MEK), especially their members in Albania. Given its undisputed role in terrorism, the Iranian Intelligence Ministry should be placed on the European Union’s terrorism list and the U.S.’s Foreign Terrorist Organizations list. The regime’s agents pose a major threat to Iranian dissidents in Albania. These agents work under various pretexts, especially as journalists. The most urgent step in protecting these refugees is to expel Tehran’s intelligence operatives by the Albanian Government. Experience has shown that when the spies and agents of Iran are tolerated, the host countries’ security would be jeopardized. Godfather of Terrorism, this time in Denmark!